Please Contact Jill for more information about guided visits with a Christian focus, doing on-site spiritual direction, or leadership availability for your group. Promotion of Visions of Mary: Art, Devotion, and Beauty at Chartres Cathedral. Released in the US in September 2017. Released in Europe in October 2017. October 27: Chartres, France. Dedication and book signing event for Visions of Mary. For more information, Contact Jill. Early November Hosting walking pilgrims from Paris to Chartres. The theme of visits and events: The Pilgrim Path. Hosted by the Women’s Ministries of the American Church in Paris. November 21: Cape Cod, Massachusetts (USA): Community of Jesus. Visions of Mary at Mout Tabor Press. December 1: St. Paul, Minnesota (USA): Wisdom Ways Center for Spirituality. Visions of Mary; Ancient Images with Modern Relevance. Program: 5:00-6:00 pm. Reception and book signing to follow. Register online or by calling 651-(651) 696-2788. (A canvas labyrinth will be available for prayer from 1:00-4:30 pm. 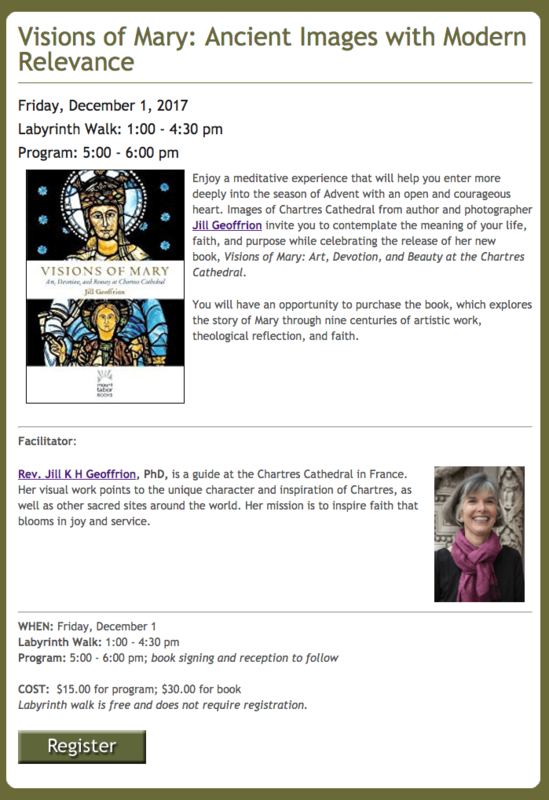 Jill will be in the United States promoting Visions of Mary, as well as working on publishing and photography projects related to prayer, labyrinths, and the Chartres Cathedral. January 27: Chartres, France : Centre Oecuménique et Artistique de Chartres et La Cathédrale de Chartres. Marie dans la cathédrale : Art, Beauté, Dévotion. Journée Œcuménique de formation et prière. Vitraux, Sculpture, Histoire, Spiritualité. Inscriptions. Chartres, France: Spiritually based visits in the Chartres Cathedral. 10 Avril. Chartres, France : Centre Oecuménique et Artistique de Chartres et La Cathédrale de Chartres. Prier Avec le Labyrinthe. 21-28 Avril. Chartres, France: Centre Oecuménique et Artistique de Chartres et La Cathédrale de Chartres. Retraite Cathédrale. Une semaine de retraite alliant la pédagogie des Exercices Spirituels de Saint Ignace et la bible de verre et de pierre de la cathédrale de Chartres, animée par une équipe de la Communauté du Chemin Neuf et le pasteur Jill Geoffrion. Jill plans to be in the United States working on photography and publishing projects related to prayer, labyrinths, and the Chartres Cathedral. Contact Jill for more information about the leadership of your event.